WASHINGTON, D.C.— Defending Rights and Dissent (DRAD) and the National Lawyers Guild (NLG) have once again teamed up to seek information about the Metropolitan Police Department’s (MPD) conduct during Inauguration protests. Earlier today, the two groups filed a Freedom of Information Act (FOIA) request seeking information about the infiltration of protest group DisruptJ20 by MPD, as well as the extent of MPD cooperation with non-law enforcement third parties like Project Veritas. During the first criminal trials stemming from the J20 protests, Officer Bryan Adelmeyer testified in open court about MPD’s infiltration of protest planning meetings. He also confirmed in testimony that Project Veritas, an ultraconservative and widely discredited organization, did the same. Prosecutors played video footage for the jury during trial that was taken by a member of Project Veritas using a hidden button-camera. 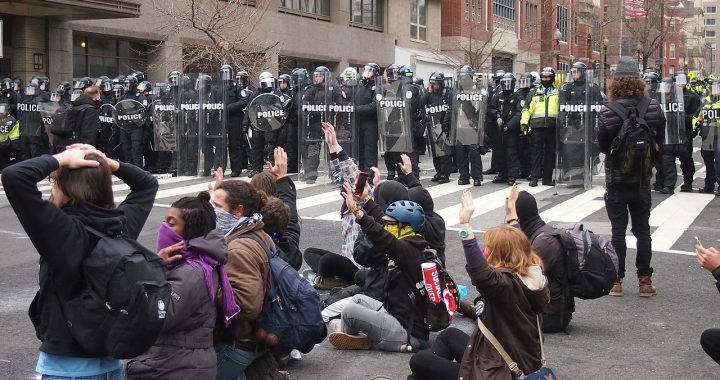 Ultimately all six defendants were acquitted by the jury; 188 defendants from the inauguration protests are still awaiting trial. “It is entirely inappropriate for the MPD to deem certain views ‘anti-establishment’ and then gather information on them. Political activism is not a crime and police infiltration of activist groups chills speech and deters political participation, which is why the City Council has explicitly imposed statutory restrictions on investigations of First Amendment protected activity. Officer Adelmeyer’s testimony raises serious questions about whether the MPD is following those restrictions and if they are relying on third parties, who have their own political goals, to evade these prohibitions,” said Chip Gibbons, Policy and Legislative Counsel for DRAD. The FOIA seeks all unredacted videos, notes, training materials, and other records concerning MPD’s infiltration of DisruptJ20 and its collaboration with far-right organizations, including Project Veritas, Oath Keepers, The Rebel Media, and Media Research Center. Defending Rights & Dissent is a national civil liberties organization that works to fulfill the promise of the Bill of Rights for everyone, with a special emphasis on protecting political expression in order to create a participatory democracy. Posted in Press Releases and tagged DC NLG, DRAD, FOIA, J20, Police, Protest.